In a world where every old-timey golf club seems to have its own signature cocktail, it’s nice to mix things up once in a while with a simple, refreshing beer. Now, don’t get us wrong—those golf club cocktails are nothing short of 19th hole miracles, both intoxicating and restorative, the stuff of legend, the reason for demolition golf cart derbies and the subsequent loss of golf cart privileges that inevitably seems to follow. In short: we love ‘em. But there’s nothing wrong with something malty, hoppy, and carbonated once in a while. Especially if you have a nice porch and a sunny day with which to enjoy it. And if that porch happens to be by the sea? Even better. Which brings us to one of the greatest porches, in our humble opinion, in the entire #@&$-ing world: the Jefferson Porch at Shinnecock Hills, in Southampton. 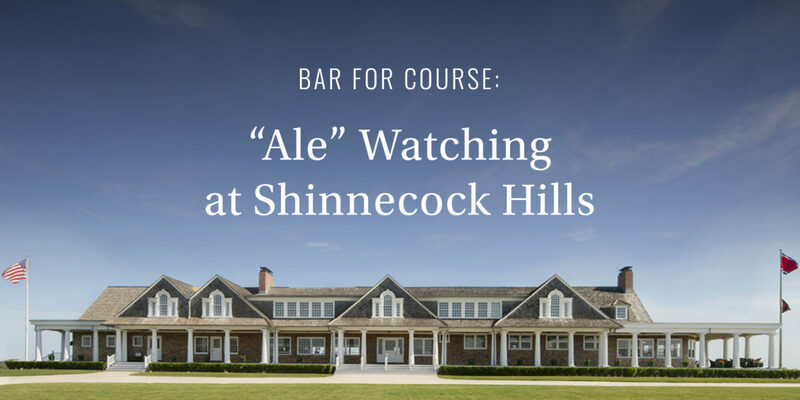 The clubhouse itself was designed by Stanford White in the early 1890s—it’s the oldest clubhouse in America—and offers a sweeping vista of the Peconic Bay. With a lineage stretching back to the earliest days of golf in this country, it bridges the gap between the game as it was played in Britain, and what it would become in America. Which might explain why it only seems fitting, on a perfect summer day amid all that wood shingling and striped awning, to order up an ice cold Bass Ale. Granted, Bass Ale was founded in England in 1777, making it a little more than a century older than Shinnecock Hills, but who’s counting? Certainly not us, especially after the fifth or sixth pint. Wait, that’s number seven, you say? Well, like we said—who’s counting?